NBA Legend Shaquille O'Neal Meets World's Smallest Primate! In support of Centre ValBio, an organization focusing their efforts to help protect the endangered natural areas and wildlife of Madagascar, NBA legend, Shaquille O'Neal speaks out for the smallest of the lemurs! 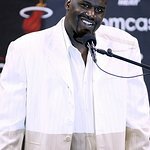 At 7’1" tall and weighing 325 pounds, Shaq got acquainted with the world’s smallest primate, a 5" long mouse lemur weighing a mere 2 ounces, during a recent visit to Zoo Miami in Florida.